EPHRAIM—Citing “historic drought conditions,” Ephraim has imposed mandatory restrictions on outdoor watering. On July 12, the city posted an announcement to its Facebook page advising residents and businesses north of Center Street to limit watering to Tuesdays and Saturdays from 7 p.m. to midnight. Residents and businesses located south of Center Street may water on Wednesdays and Saturdays from 7 p.m. to midnight. Schools and churches have been asked to water on Mondays and Thursdays from 7 p.m. to midnight. The announcement also said the city is working with Snow College to reduce water usage, but the college will not be on the citywide watering schedule because of its complex irrigation system and multiple properties. According to the city, Snow College has reduced is outdoor water use by 40 percent, and will continue to cut its usage. Ephraim does not have a secondary irrigation system so property owners use city culinary water for outdoor watering. This is the first time since 2000 that Ephraim has officially restricted water use. 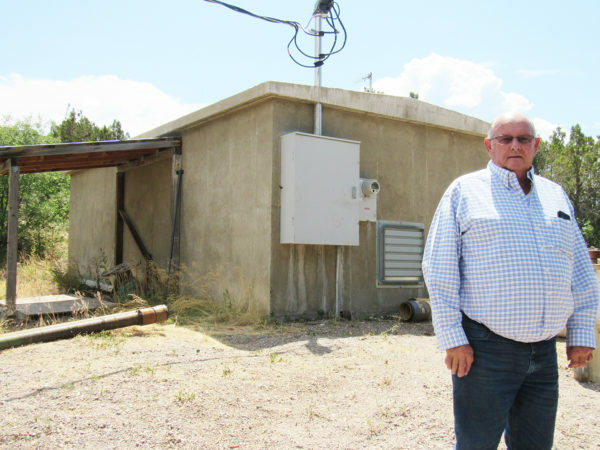 Bryan Kimball, director of community development, said Monday that restrictions had to be imposed because of severely reduced flow from the springs in mountains east of the city, which are the primary source of the city’s water. The pipeline leak earlier this summer, in which the city lost about 1 million gallons, also impacted the system, Kimball said. City workers repaired the leak quickly, but water tanks did not refill following the repairs as rapidly as the city had hoped. Kimball added that in the small amount of time the restrictions have been in place, they have already made a difference. Kimball and Chad Parry, Director of Public Works, check the water flows multiple times each day with a monitoring system, which instantaneously relays data to computers at city hall. However, Kimball also believed the restrictions could get worse before the summer is over. Especially when the Snow College students come back on campus, the stress on the system will be significant, and the slowdown from the springs will continue. MANTI—When state and local leaders got together last week in Manti to talk about the opiate crisis, it didn’t take long for the conversation to shift from drugs to underlying issues, such as mental health, transitional housing and social isolation of people who are abusing drugs. The gathering on Thursday, July 12 at the Sheriff’s Complex was organized by Randy Parker, state director of USDA Rural Development with offices in Salt Lake City. Accompanying him was Utah Attorney General Sean Reyes. Among the attendees were mayors, police chiefs and other law enforcement officers from around the county; staff from the Central Utah Counseling Center; and even representatives from the Sanpete County chapter of the Utah Farm Bureau Federation. Atty. Gen. Reyes is involved in a class action suit that states and many counties are filing against drug companies claiming the companies failed to inform, or misinformed, physicians and the public about the dangers of opiate prescription drugs, leading to an explosion of overdose deaths. Parker brought a report commissioned by the Utah Division of Substance Abuse and Mental Health. It showed that in 2014-15, the last year for which figures are available, there were 10 deaths in Sanpete County attributable to opiates. He said he has a friend who lives in the Gunnison Valley who lost a daughter to opiate use. When he asked him what led to her problems, the father said his daughter suffered from depression and anxiety. “How do we bring that into closer alignment, so we can address the issues of mental health at the same time as the self-medicating and the problems associated with misuse?” he asked. Central Utah Counseling officials responded that there is too much pigeonholing of people by diagnosis, rather than treating people for their multiple problems. Farrel Marx, chief financial officer for the counseling center, said funding is increasingly “siloed” by diagnosis, which can mean a person with a multiple diagnosis is not eligible for treatment. Even though county commissioners are supposed to be the mental health authority within a county, “there’s more and more control being exerted at the state level, because any more, they want to know where the money is going and what results they are paying for,” he said. He called for giving county commissions more authority to move money around. “We don’t have enough access to mental health in rural Utah, especially for the underinsured and Medicaid patients,” said Mayor Lori Nay of Gunnison, who sometimes helps out in her husband’s medical practice. It can take 30 days for such a patient to get into a gastroenterologist, she said. It takes six months to get someone in for mental health care. The participants also talked about how to get drug users, especially people who get arrested, into treatment. Law enforcement officials said the Sanpete County Jail is pretty much a revolving door. About the longest someone can be held after arrest is over a weekend. Frequently, users have enough money from drug activity to bail out. Users who are jailed are often terrified of going into withdrawal. “They want to get out of jail as fast as they can because they know they’re going to get dope sick,” Chief Brett McCall of the Gunnison Valley Police Department said. And, mental health officials noted, there is no facility offering detoxification in the Six-County Area. So if people can’t get out, they withdraw from opiates in jail. Several officials at the meeting said the main keys to helping addicts are social acceptance and practical things like housing and jobs. Crystal Sidwell, case manager for the Sanpete County Drug Court, said the biggest need for people trying to clean up a drug problem is transitional housing. “When they get out of jail, they don’t have anyone to call on anymore because they’ve burned all their bridges,” she said. Counseling center staff said the nearest women’s shelter is in Richfield, a two-hour round trip, and there’s nothing close at all for men. Parker made the point that opiate abuse can strike anywhere. In fact, tt has hit his own family, he said. Two days before he was to help stage a national roundtable on opiate abuse, he learned his 38-year-old daughter, who has suffered from anxiety and depression, had an opiate problem. While Salt Lake City is known for its Days of ’47 celebration on July 24, the combined festivities of seven local communities honoring Sanpete County’s pioneer heritage perhaps has the big city beat. From Fairview to Centerfield, the Pioneer Day holiday—and the days leading up to it—will be filled with hometown parades, rodeos, community dinners, fireworks and old-fashioned fun. Many of the activities are free or are provided at family-friendly prices so all can enjoy the celebrations. Following is an outline of activities by community. See the calendar and ads in this section for more detail. The celebration will be held at Anthony’s Flat on July 24 this year. Children’s games will begin at 5 p.m. and at 6 p.m. the Axtell LDS Ward will provide the meal. The Young Women’s organization will hold a small bake sale as a fundraiser after dinner. Following the meal, the Axtell Walking Stick will be presented to an individual or individuals who have been chosen as “someone who has been helpful or of benefit to the community for a long period of time,” Bishop Russell Otten said. The community celebration and the award of the walking stick have been going on for at least 15 to 20 years. Taking place next Monday evening at the park adjacent to the LDS ward chapel, Centerfield’s celebration kicks off with the parade, which has cash prizes for winning entries. A dinner of pulled pork sandwiches, hot dogs and sides will follow. (Donations are being accepted to cover the cost). There will also be an obstacle course, bounce house and kids games, along with a prize drawing, before the evening concludes with a fireworks show. The celebration in Fairview is already in full swing with various games last weekend and Lace Days at the Fairview Museum last Monday. Tonight there will be an ice breaker at the ball fields at 7 p.m. where community members can gather, enjoy some watermelon and watch the kids’ games, followed by a youth dance. Three parades over the next several days are bound to attract not just local residents but visitors from neighboring towns. The horse parade will be Saturday at 6 p.m. on State Street. The next Tuesday, July 24, and the kids parade begins at 10:30 a.m. followed by the Pioneer Day parade, typically one of the largest parades in the county each year, at 11 a.m. The Fairview Rodeo Arena will be humming over the next several days. Tomorrow night there will be a kid’s rodeo at 7. A regular Professional Cowboys Rodeo Association (PRCA) rodeo will be held on Saturday at 7:30 p.m. and an ATV rodeo on Monday 7 p.m. There will also be an ATV ride for food Saturday at 8 a.m. and a DUP program at the Rock Church on Sunday at 6:30 p.m.
On Tuesday the celebration ramps into high gear. Beginning at 7:30 a.m. local husband-and-wife (or two-member) teams can compete against their neighbors in Scrambalooza, a six-event competition now in its fourth year. Events include basketball, horseshoes, volleyball, tennis, ring toss and Frisbee throw. In addition to the parades, there will be a day of fun at the city park with the fireman’s breakfast, the EMT barbecue, old-fashioned-games, a vintage car show at the Fairview Museum and Fairview Idol competition at the dance hall. Fayette’s festivities will take place this Saturday, July 21. Typically, just about everyone in town joins in the 6:30 a.m. 5K, biking, running or walking their way around the course. Then the Fayette LDS Ward Boy Scout troop will host a fundraiser breakfast followed by the hometown parade, which will feature local children who have decorated their bicycles, Boy Scouts, representatives of the LDS Young Men and Young Women’s organizations, along with fire trucks and possibly a float or two from nearby communities. This year, the parade time has been moved to 10 a.m. The Fayette Ward will provide the meat for the potluck community lunch at the park afterward. In Mayfield, anyone who has a float is welcome to just show up to participate in Tuesday’s parade, publicity chair Lee Sorensen said. There are three great prizes for the ever-popular Wild River Duck Race, in which rubber ducks with numbers on them float down 12-Mile Creek. The prizes are a big-screen TV, a $1,000 shopping spree at Gunnison Market and $1,000 in meat from South Sanpete Pack. Sorensen said the Mayfield Lions, sponsor of the race, usually sells 1,200 to 1,500 tickets at $5. Proceeds go to fund improvements in the town park. This year there will also be a live auction at 1 p.m. to raise money for the improvements. Prizes include quilts and pictures. There will be activities during the day at the city park, including the greased pig scramble, which is great fun for kids to participate in and for everyone else to watch. “They’re just a fun group of guys,” celebration chairwoman Yvonne Wright said. On Sunday evening, Gary Parnell has organized talented local musicians to take part in the traditional old-time gospel music revival. The traditional “Saga of Spring City” a historical musical about this community, will be held Monday night, along with an ice cream social. Something new for this year’s July 24 celebration will be a children’s sidewalk chalk art contest for kids up to age 12. (The chalk will be provided). There’s something for everyone, especially people with an appetite, at Sterling’s old-fashioned celebration, which includes a breakfast sponsored by the Sterling LDS Ward bishopric, a pie-eating contest, a DUP bake sale, a Dutch oven dessert potluck, and a hot dog and marshmallow roast. The active can enjoy the 5K, three-on-three basketball and tug of war, while the competitive can sign up to beat their neighbors in the horseshoe and corn hole tournaments. And after all that food they will be able to dance it off with the Snow College Western Swing Club. The fireworks that night will be “the best show they’ve put on,” according to Yvonne Larsen, one of the organizers. CENTERFIELD—The City Council visited a controversial issue that requires homeowners to pay for sewer line breaks, even when they occur on city property. On Wednesday, Rodger Marshall, a city resident, asked the council to reimburse him almost $2200 for fixing a sewer line rupture on city property, between the main line and his home. The council tabled the vote to consult with the county’s lawyer. At stake is the issue of who is going to pay for hook-up repairs with an aging sewer system. 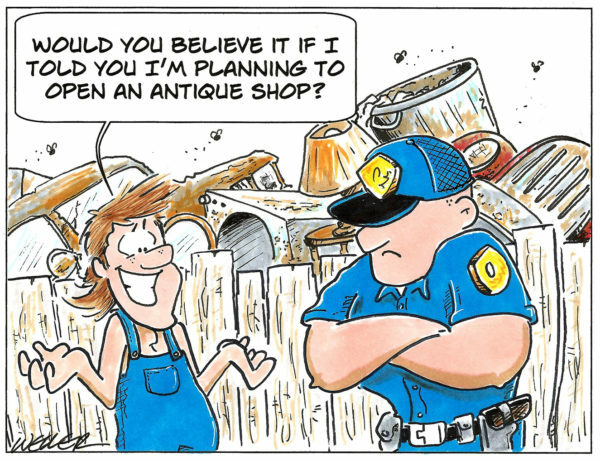 At the heart of the controversy is a 2004 city ordinance which shifted the financial obligation to repair-line breaks solely to the homeowner, should that break occur off the main line and in route to the home and not be the direct result of any city disturbance. In early June, Marshall was required to pay $2176 to repair his broken sewer line which had ruptured on the city’s property. “I was told by a city official that they were no longer responsible,” said Marshall. Current city ordinance stipulates that a licensed official must sign off on the line prior to its competition to ensure its long term viability. Yet, as of July 11, Centerfield City did not have the original inspection records necessary to verify the original work was done properly. Mayor Tom Sorensen stepped in prior to the vote to explain the town “would find itself in a lawsuit,” if the council approves the refund. “What we do for one, we must do for all,” said Sorensen. Beck, along with Councilman Jon Hansen, first proposed that Marshall be refunded. Councilman Hansen spearheaded the effort to compensate Marshall, partially on the grounds that the original work indeed appeared defective. “The pipe was not installed the way it should have been,” said Hansen. While sympathetic to homeowners, city officials have insisted their job is to uphold a proper interpretation of the city’s ordinances. 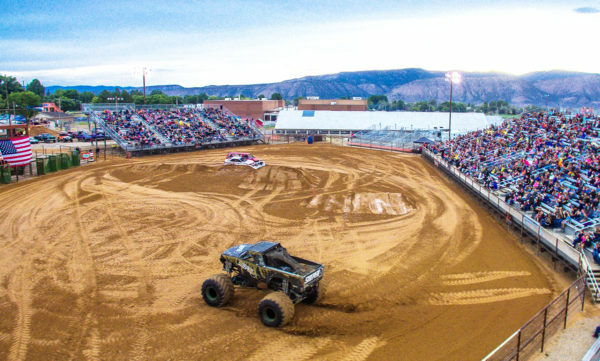 Hitman Motorsports of Bluffdale brought their Sniper monster truck to Saturday’s Monster Truck Insanity Tour, which was the first official event to be held in the new fairgrounds arena. MANTI—The new arena at the Sanpete County Fairgrounds got a proper breaking in on Saturday. The Monster Truck Insanity Tour which took place over the weekend was the first official event in the new arena. Attendance at the event was good, with the grandstands full but not cramped. A number of attendees commented on the new arena, and how they compared it to the previous iteration. Marti Fierbach of Ephraim commented at the show that she liked how the arena was open-air, as opposed to the enclosed arenas in larger cities, like the one she came from before moving to Sanpete. MT. PLEASANT—Monte Bona, director of the Mt. Pleasant Community Development and Renewal Agency (CDRA), advised the city council last week of the “high probability” the city would receive a U.S. Economic Development Agency (EDA) grant in the near future. Mt Pleasant had applied for a $356,000 EDA grant in February this year to aid in redevelopment of the area around the industrial park and old airstrip on the south side of the city. The grant would be for $249,200, with the city tasked to come up with $106,800 in matching funds. Bona told the council the CDRA had already raised approximately $52,000 toward the matching funds, and land sales could bump up that total to $75,000. Bona said the CDRA advisory board had recommended the remaining balance be taken from a CDRA reserve account upon formal announcement of the grant. Bona believes withdrawing the funds from the reserve accounts carries a low amount of risk because the city should be able to reimburse the account through future property sales. Bona said he believed he would have the formal announcement on the EDA grant by the next city council meeting. Mayor Dave Taylor outside the Sammy Well southeast of Fairview after crews repairing the well completed their work, including repairing the engine on the well pump. The Sammy Well, which taken off line earlier this summer for repairs, is now fully operational, according to Fairview Mayor Dave Taylor. Workers repaired two holes in the system, replaced the pump, cleaned the well, chlorinated the system, and last Wednesday July 11 tested the water, Taylor said. There are better alternatives for our yards; we should be encouraging and utilizing xeriscaping and drought-resistant plants. Even if we weren’t experiencing a water shortage, we still live in a desert, and it’s time to start acting like it. Ellie Anne Piep was born to Meghan Mietchen and Jorden Piep of Centerfield on July 6, 2018. She weighed 6 pounds 4 ounces. Hayzlee GraceLynne Searle was born to Terrisha Smith and Corbin Searle of Mt. Pleasant on July 6, 2018. She weighed 6 pounds.